It’s new-release time at Purple Onion, and I’m so blessed that the owner offers me up a couple Stacy Yacula stamps to play with to help get the word out. I just love her style! 🙂 Garden Blooms is the name of the new release and you can find it all here. While I like to do my shading using a light source – directional light – lots of folks do an awesome job without worrying one whit about where the lights are coming from. If you struggle with it (even after the Copic Jumpstart class), you can always just make your shading around the outside edges of the object. It can look fab even if not realistic! Watch the video below or click HERE to see it in HD on YouTube. There are some other topiaries too….they’re so simple they make a gorgeous CAS card. Below are links to the supplies I’ve used for today’s project; compensated affiliate links may used, which means if you make a purchase I receive a small commission (not at Purple Onion)at no extra cost to you. I truly appreciate your support toward the costs of running this blog! Read more. Thank you so much for your tutorials! Today I bought your Hex Chart, because no shop nearby has the copics so I have to order them online and it is nearly impossible to pick the colors I like, based on internet pictures, but your printed Hex Chart is helping. I am a huge sucker for teals, so would you be so very kind and write me the beautiful teal combination for the spherical tree on the second card? This would be superbe, although I would totally understand if you are tired of answering questions like this. 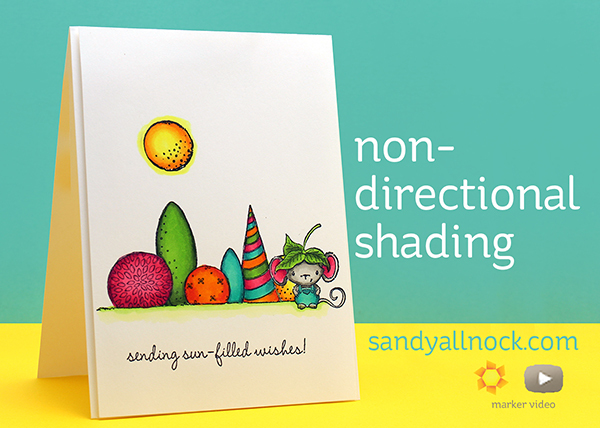 The colors are all on-screen in the video – I used the same colors that were on my desk for the other card. Great video and very cute card. I love Stacey Yakula’s images at Purple Onion stamps, and you always do them justice! Thanks for the tutorial! Thanks for the tutorial. Waiting anxiously for class to start. Another great tutorial Sandy, and I love the Purple Onion stamps. Loved the cards. Always look forward to your videos. You mentioned a chart of your favorite copic combos and I have done a search and can’t find it. Could you direct me to the location of this chart? Please. Thanks for sharing your awesome talent. Thanks Sandy. The Purple Onion images are always very endearing. The little mouse? So cute!